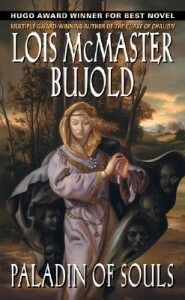 Today I’m absolutely thrilled to have a guest post from one of the great modern masters of genre writing, Lois McMaster Bujold! Her mastery of and influence on science fiction and fantasy are hard to overstate. Her best known work, the Vorkosigan Saga, is a series of novels, novellas, and short stories that is massive in scope but executed with finely crafted attention to the people that make up her universe. 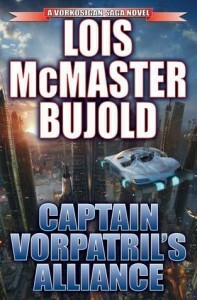 She has penned may other stories as well though: to put her career into perspective, her book Captain Vorpatril’s Alliance was recently nominated for the Hugo Award for Best Novel. 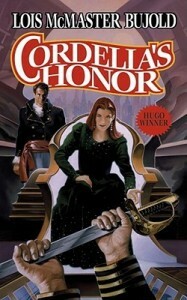 It is her tenth nomination for Best Novel, and if she wins she will tie Robert Heinlein’s record for five wins (one of his was retroactive). So, yeah, she’s pretty good. She is here today to talk about the long view of this question of women who write sci-fi and fantasy and how today’s conversations on the subject have a very familiar ring to them. I’m still trying to work out whether or not it came to a compliment. In all, since I write most of my adventure books from deep inside the point of view of a male character, Miles Vorkosigan, I’ve decided it’s all right; if I’m mimicking a male worldview well enough that even the opposition can’t tell for sure, I’m accomplishing my heart’s goal of writing true character. The comment worried me for a long time, though. A trip through the essays of Ursula Le Guin also shook my self-confidence. Was I doing something wrong? But then I wrote Barrayar, returning at last to the full range of a female character’s point of view, and I haven’t been troubled by such comments since. When Roland Green and Marty Greenberg first pitched to me the project of coediting Women at War, which would be a collection of original military science fiction stories by women writers, my initial thought was that this was a concept that would have been startlingly original—twenty-five years ago. Then the idea began to grow on me. As one of the world’s more pigheaded writers (as my own editors can testify), it seemed to me absolutely necessary to give our own invited authors the maximum possible scope and range over which to work while still embodying the theme. That way, I reasoned, we would get not work-to-order but the best possible stories, from the heart’s passion and the mind’s most fundamental convictions. Thus the reader will find here of both science fiction and fantasy, light (and dark) adventure, and deeply pondered themes, short and long, from as many different worldviews as Roland and I could round up and cram in. Also back about then, SF writer and scholar James Gunn was hired to write introductions to some of my early Easton Press signed editions. (The first time I ever met James Gunn, he handed me the Nebula for Falling Free; it made a lasting impression on both of us.) With due courtesy, he ran the introductions past me for comments before he sent them in. In the second paragraph of the introduction to The Vor Game (1990), he started off, unthinkingly, hailing me as this brave new creature on the scene, a woman SF writer. Found new-formed and motherless under a cabbage leaf, presumably. “Wait,” I wrote him back (or words to that effect). 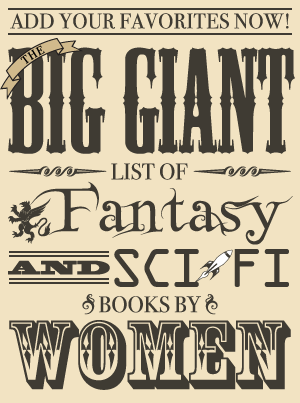 “What about Andre Norton, Leigh Brackett, C. L. Moore, Zenna Henderson, Mary Shelley for Pete’s sake, and a host (hostess?) of other early role models? I’m nothing new just for being female!” To which he sort of said, “Oh. Yeah. You’re right…” and revised the paragraph to mention about half-a-century’s worth of the on-going sisterhood of my fellow female genre writers. All of whom he knew about perfectly well; but somehow when the narrative compulsion of the essay was upon him, he’d blanked. The foremost thing that strikes me, looking back on these pieces and this period, is that we’re still having much the same conversation about women’s SF writing that we were having two decades ago, which is much the same as the one we were having two decades before that. Whenever it recurs (and it does), I am put in mind of a scene from the Disney movie of Alice in Wonderland. Alice, lost, follows a trail of animal footprints along a path – only to encounter a dog-like creature with whisk-broom whiskers walking backward over its own prints, shaking its head and sweeping out its trail into oblivion behind/ahead of it. Women have been here in these genres right along; why do conversations about its history keep erasing them? And like-minded critics were making much the same remarks in 2012, 1992, 1982, 1972, and 1962; my personal observation of the field does not go back farther than that, so I can’t speak for the prior decades. But I know which way I’d bet. I have begun to suspect the structure of these two conversations actually creates the pictures that their narratives demand, regardless of the facts, perhaps through some kind of mind-ray. In each case, the demand is dramatic: we see the stricken SF genre on the longest deathbed scene in history, or the poor-little-match-girl of female F&SF writers, crying out for the essayist to rescue them (and thus grab the heroic role). I don’t know of any way to counter this other than to keep reciting the boring facts, although one has also to remember that one knows them. Which can be hard to do, when the mind-ray strikes out of the blue of some genre argument. Possibly it would be worthwhile to keep a list of fifty or a hundred female SF writers of note in a handy e-file, and just cut-and-paste it into the conversation whenever that bewhiskered dog pops up. Lois McMaster Bujold’s e-book collection of three decades of her nonfiction writing, Sidelines: Talks and Essays, is now available in the Nook, iPad, and Amazon Kindle stores.